The sun begins to rise. Morning draws blood from the heavens. It is an omen. For I am Krark, prince of darkness! My day is dawning! My time has come! And I shall lead my army to the stars! Salamander is famous in fandom for its wonderful engineering: nearly every single piece is there for a mechanical reason, yet it's rich with detail and a joy to put together, whether or not it's for the first time. That's something missing from many newer designs (build one Liger or NJR theropod, and you can figure out the basics of all the others). And then there's the way it moves—or rather, how every part of it moves, and how it lifts its feet entirely off the ground. As if a red and silver Salamander weren't cool enough to start, Krark has quite a story behind him. He saw the the endless fights between the blue Zoids and the red mutants on Zoidstar (the comic's post-apocalyptic answer to the battle story's Zi) as futile, a waste of their power. 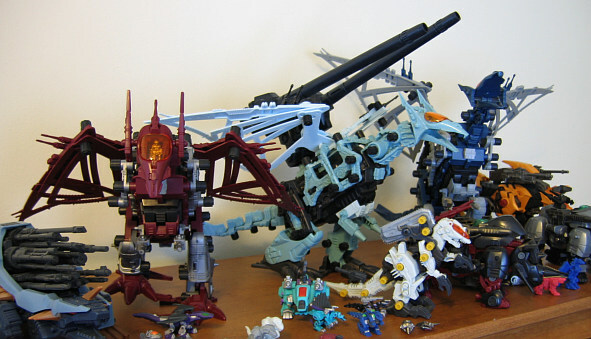 Despite being a red mutant himself, he wanted instead to unite all Zoids into a galaxy-conquering army. As the clever, calculating foil to the mindless destruction and anger of the other main powers, his aims were no more noble than any other villain's, yet likely the best hope for survival if you were a Zoid. My particular Krark is from eBay, about the only place to find them these days. They vary greatly in price, built ones being pretty easy to find but often broken. The ears and wings, especially, are a common casualty...and then there's the tail, which likes to escape and potentially vanish. A mint in box Krark will set you back a good amount, probably half for the unbuilt and half for the sheer nostalgia power the UK line commands—I opted for built, but intact. Speaking of that red and silver thing, Krark isn't a straight-up Saly recolor—his wing frames are red, rather than the silver Salamander's grey would suggest. The other change is in the missile launchers. 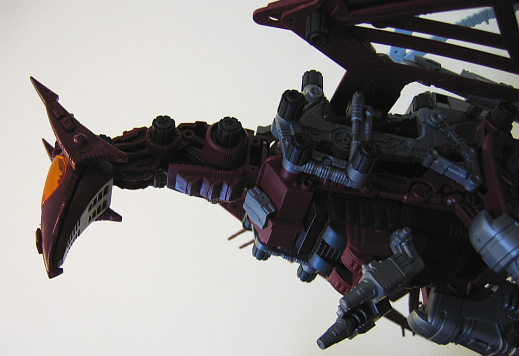 Tomy UK opted for a more drastic change to keep aspiring young engineers from adding their own springs as people do with Hasbro's Pteramander: they molded the missile launchers as one solid piece, missiles permanently part of it. You might say this is bad, but, as with Gore, it ends up looking cool. The missile launchers never were my favorite bit of Saly to start, since the missiles have a habit of either launching or trying to escape when I set them in loose, and I don't really miss them being functional. It's far less irritating than the blunting of Saber Tiger teeth that goes on these days. A finished Salamander variant is still a sight to behold, even though I've gotten a number of larger designs since I built my first one. Skeletal and pokey (Terry Pratchett thought he looked like a chicken), Krark can be anything from compact and plotting to huge and swooshyscreechy. This is thanks to his incredibly balanced walk cycle, as mentioned before. He doesn't shuffle, he stagger-struts confidently around, lifting one foot completely off the ground and carefully placing it down before lifting the other. 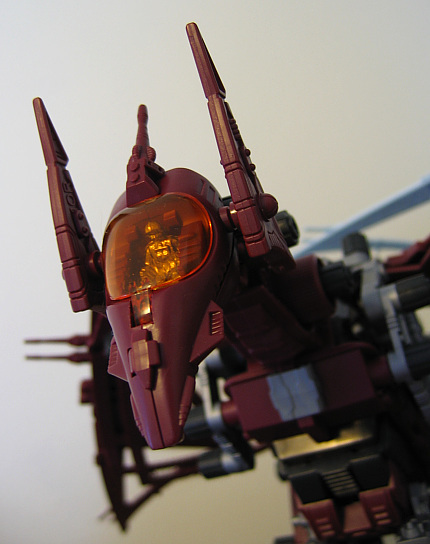 No other Zoid does this with such aplomb (few even try). I've heard of Salamanders pitching forwards, but I suspect it's more any sort of carpet or rough/uneven surface being death to them more than the design—or else a bad batch or two. I've built and tested four stable Saly and counting in this house, though, including a Bombvern with CP-10. If that walk isn't enough for you, Krark also opens and closes his mouth in time with the motor hitting a screechier point (making for a nice screech on my newer Salys and a slight variation in Krark, whose motor seems to be getting on a bit), swishes his tail (a bit awkwardly—stiff tails are Saly's one weak point), and lifts and unfurls his wings in a typically Tomy simple yet genius way. He's a kids' toy of the very best kind, the kind where someone really gave a damn and it appeals to just about everyone. ...and man, does he stare. Even with him pointing away from my head, I get the feeling he's watching me. Saly has an odd air of intelligence about it to start, and the red/silver colors and backstory amplify it in Krark's case. Silver pilot glinting and Gul Tiger by his side, he menaces the bookcase and accompanying boxes, perhaps plotting to take them over and seize control (if the Dark Zoids don't get there first). Salamander will always be very high on my recommended Zoids list. Unless you don't like the motors at all, it's sure to impress and isn't terribly hard to find in some form. If you have a bit extra cash to spare, dig 80s nostalgia and/or red, or just want more Salamanders than the original blue flavor (as Gilvy says, you can't eat just one), why not make that Salamander variant Krark?